We haven’t been sick much since embarking on our new healthy culinary adventure 5 months ago. That’s saying a lot, since we used to be sick ALL the time! I do have a cold right now, though (pretty mild, but annoying). This gluten and dairy free creamy chicken soup makes you feel better just looking at it! Make sure to add the mushrooms and celery for an added boost to your immune system. To save time you can find pre-chopped onions, carrots, and celery from Trader Joe’s, pre-chopped mushrooms, and you can use left over chicken, or the pre-cooked kind. If you’ve been following my blog you’ll know that I’m a huge proponent of beans! I highly recommend investing in some white bean flour , because it is so much healthier for you than refined grain flours, and it works really well to thicken sauces and soups. There are 7 grams of protein, 8 grams of fiber, 15% of your daily iron intake, and 6% of your daily calcium intake in just 1/4 cup of bean flour. Plus, it has resistant starch, which feeds the healthy flora in your intestines and helps you lose weight, because you feel full quickly, but don’t absorb all the calories. I’ve only been able to find the white bean flour on Amazon . I do NOT recommend garbanzo bean flour…ew! If you don’t like bean flour, use potato starch . It’s not as healthy as the bean flour, though, partly because it is very high on the Glycemic Index. Before we get to the recipe for the Spicy Raw Broccoli Salad, I want to invite you to join with others who are making healthy changes. I’d love to walk alongside you in your journey towards wholeness and health! Jesus said, “I have come that they may have life, and have it to the full!” Freedom from food addictions is part of having a truly full life. Sauté your veggies in a little coconut oil over medium heat in a large dutch oven until they’re soft and light brown. 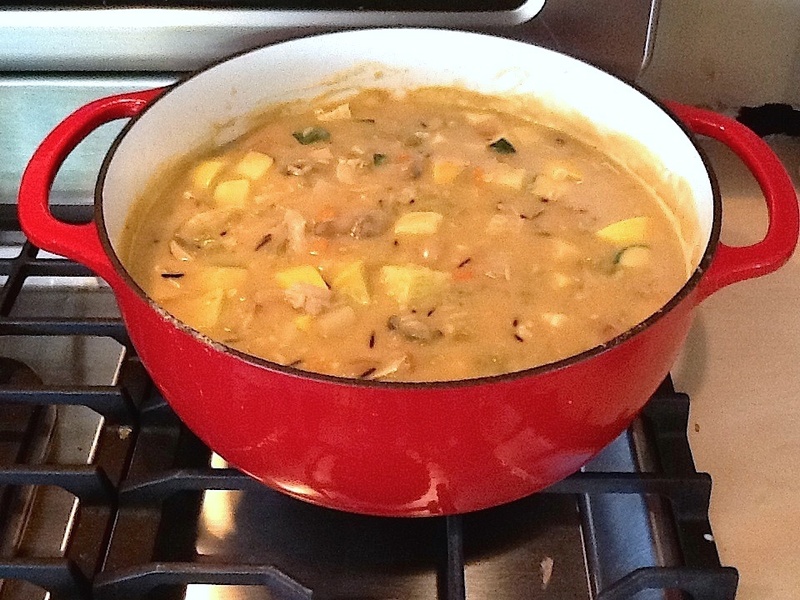 If you do not own a large dutch oven, I highly recommend you buy one…perfect for soup making season! Stir in the bean flour just before adding the broth and other ingredients. Bring the mixture to a boil. Turn it down to low heat and let simmer, covered, until you are ready to eat it. If you are in a hurry keep it at a medium boil until the rice and potatoes are tender. Note: you may need to add water or broth as the rice cooks and the soup thickens…make sure to check it and stir periodically. Serve with Buckwheat Walnut Gluten Free Bread. One Response to "Dairy Free Creamy Chicken Soup with Wild Rice"